Anthony Bourdain typically floats above the fray of petty social media spats and the outrage chorus coursing through Twitter, but that doesn't mean he never unwittingly fans the flames. 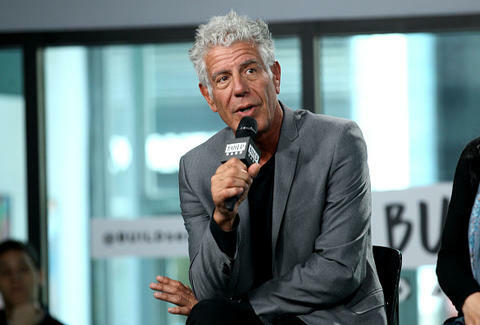 On Thursday, the celebrity chef and globetrotting host of CNN's Parts Unknown managed to fall afoul of Twitter, earning his book imprint, Anthony Bourdain Books (@BourdainBooks), a swift suspension from the platform for ostensibly being too liberal with profanity. Woah. The @bourdainbooks account just got suspended for using the title of our latest book?!?! The book, by Michael Ruffino, is described on Amazon as "The riotous and unbridled confessions of a debauched rock and roller and his adventures in excess while touring Middle America on the ’80’s hair-metal nostalgia circuit." As Food & Wine points out, the book's tales of a drug-laden '80s hair metal scene are likely to abound with far worse imagery than the occasional naughty swear word can conjure. Still, though, the account for Bourdain Books remains suspended, and there isn't any word when its tweeting privileges will be granted again. But that's hardly an Earth-shattering dilemma when you're Anthony Bourdain. The food icon has multiple creative irons in the fire that Twitter fortunately can't block from the internet, such as the opening of NYC's Bourdain Market, which promises to rival some of the world's greatest culinary smorgasbords when it debuts in 2019. And before that, Bourdain's new documentary, WASTED! The Story of Food Waste, is destined for its on-demand and theatrical release on October 13. As of Friday afternoon, the account appeared to be reinstated, but cleared of any tweets and branding. But, all said, the incident will likely serve to help promote the new book, and will likely have little impact on Bourdain's tendency to drop an expletive or two.